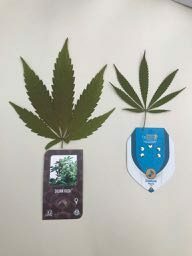 It is not illegal to buy cannabis seeds, it is illegal to grow cannabis seeds. In most countries, police do not get involved if they believe your plants are for personal use. In the UK you are unlikely to be charged for less than 10 plants but the police would probably confiscate the plants if there was a complaint. If thousands of people were to grow three or four plants and learn about this remarkable plant, I believe cannabis would be legalized and regulated for recreational use as it is in Canada and parents would know more about it. Cant be right, that it is easier for a teenager to buy very strong cannabis than it is to buy a glass of wine. Now is the time to buy seeds with a view to germinating them and planting outside in mid to late May. A Google search of the interned shows hundreds of suppliers of seeds. I have chosen two suppliers on the basis they were in Europe and provide a good service (delivery within 4 working days). I have absolutely no commercial relationship with this company or any other cannabis company. I will never sell adds or try to make money for myself from this. I am doing it because so many people were contacting me asking for advice and putting what I know on this site makes my life easier. I am sure there are lots of people who know more than me about this subject and I am happy to be corrected especially on my gardening knowledge. I will focus on the two main varieties of Cannabis, “Indica” and “Sativa”. Indica is the strain that was recommended by Rick Simpson when I first started researching cannabis for my cancer in 2013 and he stated the oil should be high in THC, the psychoactive part of the bud which gets you high. This type of cannabis is often referred to as “skunk” as getting stoned is what many youngsters set out to experience when they first try cannabis. Skunk is what most drug dealers find easiest to sell and specialise in supplying it. When in fact there are hundreds of strains of cannabis which have very different effects. In France children are introduced to wine by diluting it before they start drinking at 18. If you went into an off licensee to try alcohol, it would not be wise to start with spirits 80% alcohol. Some probably do and if they continue it will damage their health, just as chronic smoking cannabis with high levels of THC will. In addition casnnabis bough on black market may have pesticides and who knows what contaminating it. The first thing to do is to find out what you want cannabis to achieve you can do this on Google and buy a strain that meets those needs. The Hash Museum in Amsterdam has a “Sensi” seed shop attached to it and it was there I bought my first seeds for growing Indica, high in THC in 2016. 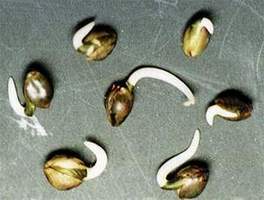 The seeds have to be female, “Feminized” as the male seed does not produce the buds which contain the active ingredient. I always thought it was the leaves. 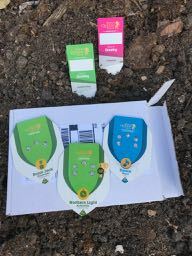 I lost two plants in the early stage as the plants are very delicate in the first growth phase. This is the cannabis that is called “Skunk”, the oil is extremely concentrated and potent and very unpleasant to start with but as I was terminally ill, I did not have time to get used to it resulting in psychosis which was not pleasant although I can laugh at it now. I continue to take a small amount each week so I have ordered the same again. The police could come and confiscate them and who would benefit from that the drug dealer and the quality of cannabis will not be as good. 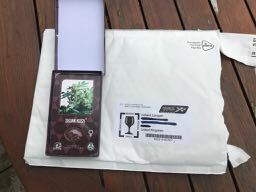 The seeds arrived in a pox in an envelope total cost of 5 seeds and postage 47 euros. To try the Sativa variety of Cannabis I bought from another suplier called “Royal Queen Seeds” This came in a small box with more information about their products, the seeds cost approximately the same price. I would say there was little difference between both suppliers and the service was excellent. The Sativa strain I bought was called Royal Dance it has a THC/CBD ration of 1/1 which is identical to the spray “Sativex” a patented dug found to be beneficial to people with Multiple Sclerosis GW pharmaceuticals produce Sativex, it costs £500 a month and is not available on the NHS. As long as cannabis is illegal they can charge those prices. You can also buy seeds “Automatic” hybrid plants. They grow much quicker and are smaller but you could probably have two harvests this summer as the buds come out automatically and dont need the shorter October days to flower. Do you know more than doctors? Cannabis Wellbeing & Epilepsy! OK – sounds like a plan – I lose about 10% of the stuff I try to grow so how much oil can you extract from 4-5 seeds? fingers crossed, they germinated far quicker than normal. I was warmer where I put them and two had started to grow what looked like leaves so we will see over the next few days. Germinated 9 seeds.